In the MDG Link for DOORS you can create a link between a selected Sparx Systems Enterprise Architect Package and an existing IBM® Rational® DOORS® module, which enables you to exchange requirements data between DOORS and Enterprise Architect. You can also redirect the link to a different module. Through this link you can import data from DOORS to Enterprise Architect, and export data from Enterprise Architect to DOORS. 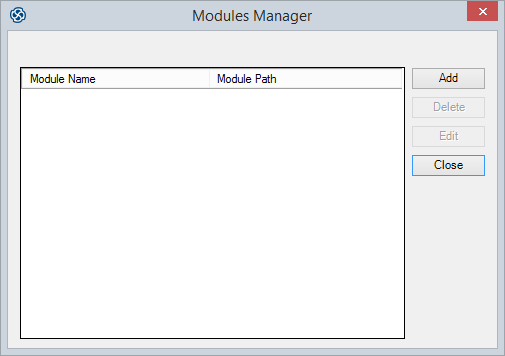 You use the 'Modules Manager' dialog to locate an existing DOORS module and create a link to it. On the 'Modules Manager' dialog, click on the Add button. The 'Add/Edit Module' dialog displays. In the 'Module Name' field, type a name to identify the link to the module. Click on the Select Module button to open the 'Browse - DOORS' dialog (in DOORS itself). 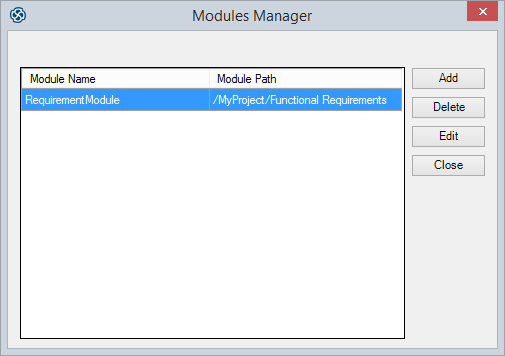 Expand the module hierarchy as necessary to locate the required module, and click on it. Click on the OK button to return to the 'Add/Edit Module' dialog, which now displays the module path and name in the 'Module Path' field. Click on the Save button. The 'Module Manager' dialog redisplays, showing the newly-created module link. You can now use this link to exchange requirements data between Enterprise Architect and DOORS. Click on the Close button to close the dialog. 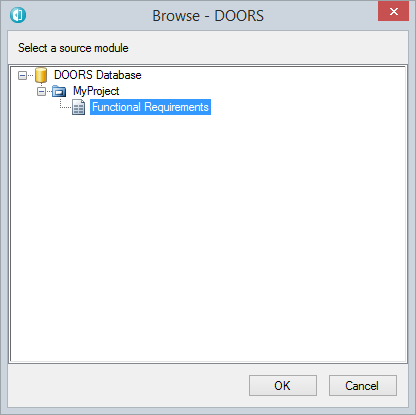 If the existing link to the DOORS module is not appropriate, you can delete or redirect it. On the 'Modules Manager' dialog, click on the link to change. On the 'Add/Edit Module' dialog, click on the Select Module button to display the 'Browse - DOORS' dialog (in DOORS). Expand the hierarchy as necessary on the 'Browse - DOORS' dialog, and click on the replacement module for the link. Click on the OK button to return to the 'Add/Edit Module' dialog, which now shows the module path of the replacement module. Note that you cannot edit the link name. Click on the Save button. The 'Module Manager' dialog redisplays, showing the edited module link.